Nimbyism - or Plain Common Sense? Councillor David Millican, Ealing Conservative Group Leader, and representing local Northfield Ward, reports on the packed Hounslow Council’s Brentford and Isleworth Area Committee on Thursday 26 January. The plan to re-develop Reynard Mills, the former BBC site, on Windmill Road, Brentford, right on the border with Little Ealing, has re-surfaced with a fresh proposal for 275 flats in 6 and 7 storey blocks. There was standing room only as 75 residents packed the meeting and made their voices heard as local resident Mark Trowell told the Hounslow Councillors that the proposed development for 275 flats would be too dense and out of character for the neighbourhood. The new residents would generate too much traffic on narrow Windmill Road, he said, and, as there would not be enough car parking spaces, the new residents would inevitably park nearby clogging up neighbouring roads. The developer’s architect addressed the meeting and explained that their plans had been scaled back from the original development of 315 flats and would be one storey less. The three Northfield Councillors have lobbied Brentford Councillors assiduously to reject the proposals and have formally objected. This appeared to pay off as every Councillor, who spoke,criticised the plans. 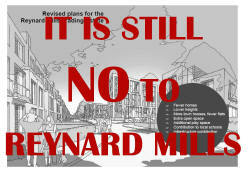 One Brentford Councillor said he had received 150 letters of objection and only one in favour. The proposals will now be considered by Hounslow’s Sustainable Development Committee, which acts as the Planning Committee.